Five Mass Communication students (two degree students and three diploma students) participated in the competition and were guided by their lecturer, Ms. Haryati Hashim. It was a collaboration with AIA Life Insurance Company Malaysia for the AIA Innovative Design Challenge Competition. INTI International University (IIU) students worked hard in the challenge to compete with the other two groups of INTI International College Subang (IICS) students. It was a rather difficult for students to produce high quality ideas with standards set by the AIA company, throughout the monthlong competition. Students worked closely with assigned AIA staff, who guided and monitored their weekly progress, and also made sure it aligned with the AIA standards. Their hard work paid off when IIU students won the competition with their 3-5 minute long MyPage User Instruction Video (which teaches users how to register and use its main functions). The judges were satisfied with their simple and easily applicable video for AIA users. It was the very first collaborative event with AIA Berhad. The initial idea was an employer project called, “INTI CX Multimedia Projects”. However, the Director of Innovation, Arnold Aranez changed his mind to challenge students into competition, during their first meeting at Wisma AIA instead. The competition was only open to Mass Communication and Graphic Design students, and the battle was between IIU and IICS students. The aims of this competition were to engage with INTI students and to give them the opportunity to produce videos, as well as materials on how to use new apps that they just developed. They were also looking for promotional videos to support their key innovation projects in 2017. The three projects proposed by AIA were a 3-5 minute MyPage User Instruction Video (which teaches users how to register and use main functions), an iServe App Agent Instruction Video, and a HR Journey Video. IIU students were asked to produce the MyPage User Instruction Video (the first project as mentioned above). This training video is useful for students as it gives them a better understanding on how to produce professional quality videos, and makes it easy for staff to train their customers, ‘Training Video for Customer Express’. The students also had the opportunity to work closely with the AIA professional team and got to be exposed to a multinational company. Students were guided by the ‘MyPage’ team who are experts in the area. The assigned coach worked closely with students to ensure the contents were accurate, simple and support the brand reputation. They presented their weekly progress through face-to-face meetings at AIA, Ampang and communicated via email for weekly feedbacks. This competition was able to train students on their teamwork spirit, leadership skills, communication and presentation skills. It was a tough journey to complete the video contents because each department (branding and MyPage) carried different aims. Furthermore, miscommunication occurred during approval stages due to the lack of communication among the departments. The branding department was the one who were really concerned with the video content. They ensured that each scene and storyline supported the actual services (in reference to the MyPage User Instruction Video) without any error. 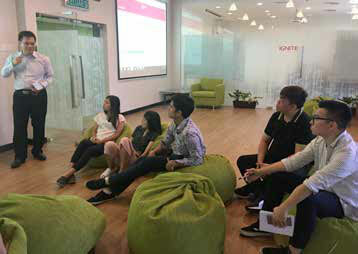 It was a good exposure for students, as they learned the importance of branding in sustaining a company’s reputation, and they managed to give their best service to the customers. Five final year students from the Bachelor of Arts (Hons) Mass Communication programme took part in a project with Flex, a multinational technology manufacturer in Penang to develop a new communication strategy that allows the employer to engage with existing and new hires. They also had to conduct a survey to analyse public perception towards Flex. The students were able to integrate academic knowledge with industry practices, take on more workrelated responsibilities and develop fresh perspectives as well as skills regarding their course of study. The experience also allowed the five students to gain a better understanding on choosing their careers and increased their employability. 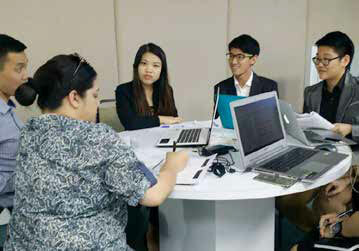 Flex, a multinational technological manufacturer based in Bayan Lepas worked with group of five students from the Bachelor of Mass Communication programme to develop a new communication strategy. While the communication strategy was focused on engaging with existing employees and new hires, the students were also required to analyse public perception towards Flex as well as propose the necessary recommendations, all within a period of four months. The students had to conduct a survey that covered both internal and external audiences, look into areas such as social media, knowledge on Flex, external perception towards Flex, as well as the preferred type of communication platforms and messages. The project allowed the students to strengthen their analytical thinking, build on their problem-solving skills, presentation and leadership skills and most importantly, to work effectively as a team. Throughout the project, the students made use of their academic knowledge and combined this with industry practices. While doing the survey, they learnt the importance of communication and employee engagement in an industrial setting. Facilitated by their academic supervisor, they engaged with the representatives from Flex to obtain additional industry insights to help strengthen their project, as well as keep them updated on the progress of the project. The survey which was conducted with both internal and external audiences gave the students the opportunity to obtain information on the communications challenges that existed and from there, used their knowledge to design insightful communication strategies to address the issues. This project provided these five students with quality industry exposure – learning on the job to understand the needs of the employers, putting in place suitable communication strategies via the right communication platforms, including the use of social media to ensure employee engagement and overall communication goals are met. Although it was a steep learning curve, it allowed them to learn about the importance of communicating effectively with all stakeholders. Flex was pleased with the work ethics demonstrated by the students – their ability to work independently, good time management, strong leadership qualities and variety of skills used to complete the project within the stipulated time frame. 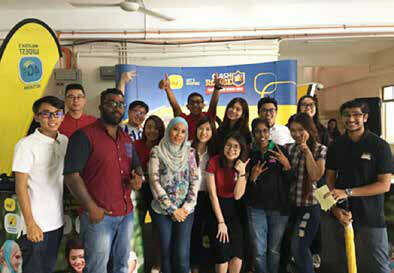 A group of mass communication students majoring in advertising from INTI International University, guided by their lecturer Ms. Haryati Hashim, collaborated with Digi Telecommunications Sdn. Bhd. in an employer project. The team was separated into 3 groups; one for the Capture App, one for the MyDigi App and the other for Digi’s Direct Billing. During the initial planning, the three groups had come up with ideas for their own group, but later saw the benefit in using the ideas collectively to achieve better results. Towards the end, the three groups were working together to achieve their goals collectively as a single unit, which strengthened the effect of the campaign. While the whole team did not meet often, the three individual group leaders communicated well among each other to make sure everything was running smoothly. The group leaders kept their group members well-informed which resulted in the success of the campaign. Students have the opportunity to present the idea to the employer at their company. Students are required to fulfil 3 check points: meeting employer expectations at 1st meet, mid check point at 2nd meet and final presentation at 3rd meet. “I was quite worried in the initial stages as the progress was slow and there were many complications, but we caught up towards the end and everything went well, and I couldn’t have asked for a better team,” the team leader said after the campaign. She mentioned that the team had put in a lot of effort and carried out their individual duties very well, especially on the day of the campaign.